Young Living is offering free shipping on all Quick Orders over 50PV to current retail and wholesale members on August 13th-17th, 2018! Some exclusions apply, please see the list at the bottom of the webpage. We've created a few bundle ideas of products that are perfect for this upcoming season! Each product includes a direct link so you can easily add to your cart in the Virtual Office and be on your way! 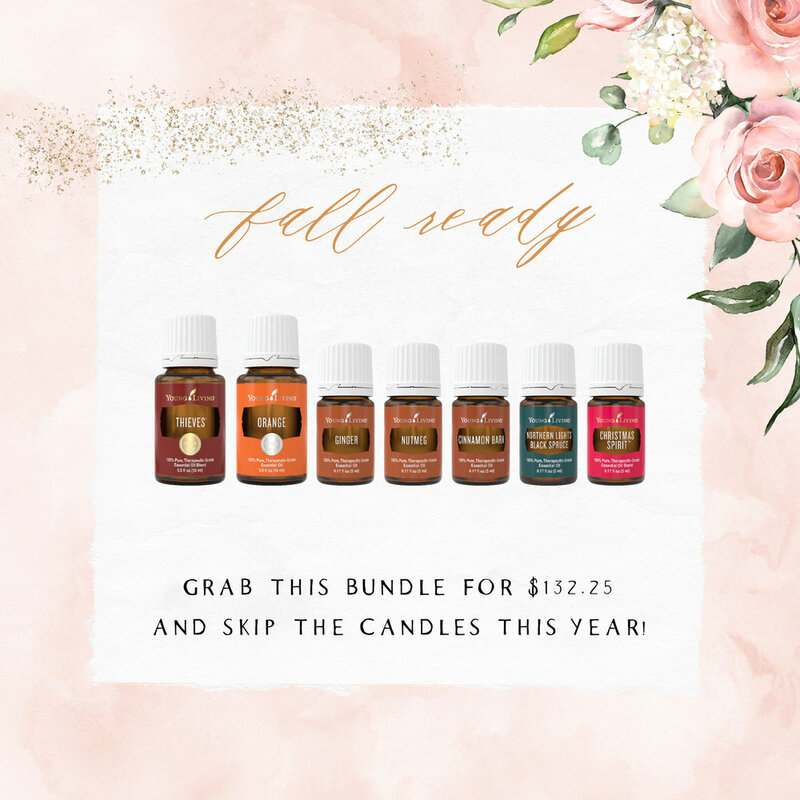 Grab this bundle of fall oils for only $132.25! Thieves, Orange, Ginger, Nutmeg, Cinnamon Bark, Northern Lights Black Spruce, and Christmas Spirit are all absolute favorites for our diffuser in the cool months! The KidScents oils are perfect and prediluted for kiddos ages 2+! We love having them ready and on hand! And you can never have too much safe hand purifier!! GeneYus, SniffleEase, Owie, SleepyIze, TummyGize, and Hand Purifier are a great bundle to order! The icky season is coming up fast, don't be caught without these wellness supporting products!! Thieves Cough Drops, Super C, Thieves, R.C., and Oregano are must-haves! Tips: Roll Thieves on the bottom of your feet to support your immune system! Apply R.C. to your chest for lung support. Take Super C daily to combat the ickies. And Oregano Vitality to a capsule and take internally. Ditch the toxic makeup and get started with Savvy Minerals! You can purchase a starter kit or items individually during the sale! This clean makeup is incredible and you can learn more and grab yours here today! Never placed a Quick Order? It’s easy!! 2️⃣Login with your username and password? Can’t remember your member id? Ask your enroller! 3️⃣While you are there, bookmark the site to your favorites! And check the “keep me signed in” box! 5️⃣Add to your cart and checkout! If you don’t see the free shipping, make sure none of the items you added to your cart are on the exclusions list! Boom!! Enjoy your new items!! The free shipping offer excludes all other starter kits besides Savvy Minerals, it also excludes NingXia products, Seedlings Baby Wipe Packs, and a few other items. Please see the complete list here. If you include any of these items in your cart, your order will not qualify for free shipping so please be mindful of these exclusions.